Applications and the study of phenomena have in turn inspired the proposal of new stochastic processes. Examples of such stochastic processes include the Wiener process or Brownian motion process,[a] used by Louis Bachelier to study price changes on the Paris Bourse, and the Poisson process, used by A. K. Erlang to study the number of phone calls occurring in a certain period of time. These two stochastic processes are considered the most important and central in the theory of stochastic processes, and were discovered repeatedly and independently, both before and after Bachelier and Erlang, in different settings and countries. -dimensional Euclidean space. An increment is the amount that a stochastic process changes between two index values, often interpreted as two points in time. A stochastic process can have many outcomes, due to its randomness, and a single outcome of a stochastic process is called, among other names, a sample function or realization. to denote the stochastic process. and its value is one, while the value of a tail is zero. In other words, a Bernoulli process is a sequence of iid Bernoulli random variables, where each coin flip is an example of a Bernoulli trial. 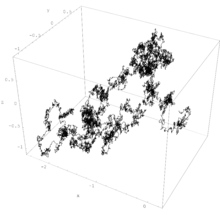 , this random walk is called a symmetric random walk. , the resulting process is called an inhomogeneous or nonhomogeneous Poisson process, where the average density of points of the process is no longer constant. Serving as a fundamental process in queueing theory, the Poisson process is an important process for mathematical models, where it finds applications for models of events randomly occurring in certain time windows. -dimensional Euclidean space or other mathematical spaces, where it is often interpreted as a random set or a random counting measure, instead of a stochastic process. In this setting, the Poisson process, also called the Poisson point process, is one of the most important objects in probability theory, both for applications and theoretical reasons. But it has been remarked that the Poisson process does not receive as much attention as it should, partly due to it often being considered just on the real line, and not on other mathematical spaces. A Markov chain is a type of Markov process that has either discrete state space or discrete index set (often representing time), but the precise definition of a Markov chain varies. For example, it is common to define a Markov chain as a Markov process in either discrete or continuous time with a countable state space (thus regardless of the nature of time), but it has been also common to define a Markov chain as having discrete time in either countable or continuous state space (thus regardless of the state space). It has been argued that the first definition of a Markov chain, where it has discrete time, now tends to be used, despite the second definition having been used used by researchers like Joseph Doob and Kai Lai Chung. -dimensional Euclidean space, which results in collections of random variables known as Markov random fields. is a discrete-time martingale. In this aspect, discrete-time martingales generalize the idea of partial sums of independent random variables. , which gives the interpretation of time. Important stochastic processes such as the Wiener process, the homogeneous Poisson process (in one dimension), and subordinators are all Lévy processes. -dimensional Euclidean space or some manifold. In general, a random field can be considered an example of a stochastic or random process, where the index set is not necessarily a subset of the real line. But there is a convention that an indexed collection of random variables is called a random field when the index has two or more dimensions. If the specific definition of a stochastic process requires the index set to be a subset of the real line, then the random field can be considered as a generalization of stochastic process. -dimensional Euclidean space, or more abstract spaces. Sometimes the term point process is not preferred, as historically the word process denoted an evolution of some system in time, so a point process is also called a random point field. There are different interpretations of a point process, such a random counting measure or a random set. Some authors regard a point process and stochastic process as two different objects such that a point process is a random object that arises from or is associated with a stochastic process, though it has been remarked that the difference between point processes and stochastic processes is not clear. -dimensional Euclidean space. Other stochastic processes such as renewal and counting processes are studied in the theory of point processes. can represent a point in space. But in general more results and theorems are possible for stochastic processes when the index set is ordered.
. Other names for a sample function of a stochastic process include trajectory, path function or path. -dimensional Euclidean space or more abstract spaces such as Banach spaces. , so the law of a stochastic process is a probability measure. can be interpreted as time, a stochastic process is said to be stationary if its finite-dimensional distributions are invariant under translations of time. This type of stochastic process can be used to describe a physical system that is in steady state, but still experiences random fluctuations. The intuition behind stationarity is that as time passes the distribution of the stationary stochastic process remains the same. A sequence of random variables forms a stationary stochastic process if and only if the random variables are identically distributed.
. Khinchin introduced the related concept of stationarity in the wide sense, which has other names including covariance stationarity or stationarity in the broad sense. -dimensional Euclidean space as well as to stochastic processes with metric spaces as their state spaces. Separability is a property of a stochastic process based on its index set in relation to the probability measure. The property is assumed so that functionals of stochastic processes or random fields with uncountable index sets can form random variables. For a stochastic process to be separable, in addition to other conditions, its index set must be a separable space,[c] which means that the index set has a dense countable subset. After Cardano, Jakob Bernoulli[e] wrote Ars Conjectandi, which is considered a significant event in the history of probability theory. Bernoulli's book was published, also posthumously, in 1713 and inspired many mathematicians to study probability. But despite some renown mathematicians contributing to probability theory, such as Pierre-Simon Laplace, Abraham de Moivre, Carl Gauss, Siméon Poisson and Pafnuty Chebyshev, most of the mathematical community[f] did not consider probability theory to be part of mathematics until the 20th century. In 1933 Andrei Kolmogorov published in German his book on the foundations of probability theory titled Grundbegriffe der Wahrscheinlichkeitsrechnung,[i] where Kolmogorov used measure theory to develop an axiomatic framework for probability theory. The publication of this book is now widely considered to be the birth of modern probability theory, when the theories of probability and stochastic processes became parts of mathematics. 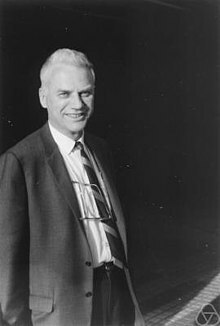 In 1953 Doob published his book Stochastic processes, which had a strong influence on the theory of stochastic processes and stressed the importance of measure theory in probability. Doob also chiefly developed the theory of martingales, with later substantial contributions by Paul-André Meyer. Earlier work had been carried out by Sergei Bernstein, Paul Lévy and Jean Ville, the latter adopting the term martingale for the stochastic process. Methods from the theory of martingales became popular for solving various probability problems. Techniques and theory were developed to study Markov processes and then applied to martingales. Conversely, methods from the theory of martingales were established to treat Markov processes. The Bernoulli process, which can serve as a mathematical model for flipping a biased coin, is possibly the first stochastic process to have been studied. The process is a sequence of independent Bernoulli trials, which are named after Jackob Bernoulli who used them to study games of chance, including probability problems proposed and studied earlier by Christiaan Huygens. Bernoulli's work, including the Bernoulli process, were published in his book Ars Conjectandi in 1713. -dimensional integer lattices, George Pólya published in 1919 and 1921 work, where he studied the probability of a symmetric random walk returning to a previous position in the lattice. Pólya showed that a symmetric random walk, which has an equal probability to advance in any direction in the lattice, will return to a previous position in the lattice an infinite number of times with probability one in one and two dimensions, but with probability zero in three or higher dimensions. Another approach involves defining a collection of random variables to have specific finite-dimensional distributions, and then using Kolmogorov's existence theorem[j] to prove a corresponding stochastic process exists. This theorem, which is an existence theorem for measures on infinite product spaces, says that if any finite-dimensional distributions satisfy two conditions, known as consistency conditions, then there exists a stochastic process with those finite-dimensional distributions. 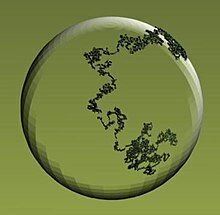 ^ The term Brownian motion can refer to the physical process, also known as Brownian movement, and the stochastic process, a mathematical object, but to avoid ambiguity this article uses the terms Brownian motion process or Wiener process for the latter in a style similar to, for example, Gikhman and Skorokhod or Rosenblatt. ^ In the context of point processes, the term "state space" can mean the space on which the point process is defined such as the real line, which corresponds to the index set in stochastic process terminology. ^ The term "separable" appears twice here with two different meanings, where the first meaning is from probability and the second from topology and analysis. For a stochastic process to be separable (in a probabilistic sense), its index set must be a separable space (in a topological or analytic sense), in addition to other conditions. ^ The definition of separability for a continuous-time real-valued stochastic process can be stated in other ways. ^ Also known as James or Jacques Bernoulli. ^ It has been remarked that a notable exception was the St Petersburg School in Russia, where mathematicians led by Chebyshev studied probability theory. ^ The name Khinchin is also written in (or transliterated into) English as Khintchine. ^ The theorem has other names including Kolmogorov's consistency theorem, Kolmogorov's extension theorem or the Daniell–Kolmogorov theorem. ^ a b c d e f g h i Joseph L. Doob (1990). Stochastipoic processes. Wiley. p. 46 and 47. ^ a b c d L. C. G. Rogers; David Williams (13 April 2000). Diffusions, Markov Processes, and Martingales: Volume 1, Foundations. Cambridge University Press. p. 1. ISBN 978-1-107-71749-7. ^ a b c J. Michael Steele (6 December 2012). Stochastic Calculus and Financial Applications. Springer Science & Business Media. p. 29. ISBN 978-1-4684-9305-4. ^ a b c d e Emanuel Parzen (17 June 2015). Stochastic Processes. Courier Dover Publications. p. 7 and 8. ISBN 978-0-486-79688-8. ^ a b c d e f g h i j k l Iosif Ilyich Gikhman; Anatoly Vladimirovich Skorokhod (1969). Introduction to the Theory of Random Processes. Courier Corporation. p. 1. ISBN 978-0-486-69387-3. ^ a b c d e Gagniuc, Paul A. (2017). Markov Chains: From Theory to Implementation and Experimentation. USA, NJ: John Wiley & Sons. pp. 1–235. ISBN 978-1-119-38755-8. ^ François Baccelli; Bartlomiej Blaszczyszyn (2009). Stochastic Geometry and Wireless Networks. Now Publishers Inc. ISBN 978-1-60198-264-3. ^ a b Marek Musiela; Marek Rutkowski (21 January 2006). 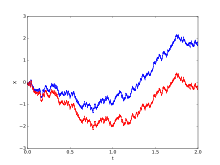 Martingale Methods in Financial Modelling. Springer Science & Business Media. ISBN 978-3-540-26653-2. ^ Iosif Ilyich Gikhman; Anatoly Vladimirovich Skorokhod (1969). Introduction to the Theory of Random Processes. Courier Corporation. ISBN 978-0-486-69387-3. ^ Murray Rosenblatt (1962). Random Processes. Oxford University Press. ^ a b c d e f g h i Jarrow, Robert; Protter, Philip (2004). "A short history of stochastic integration and mathematical finance: the early years, 1880–1970". A Festschrift for Herman Rubin. Institute of Mathematical Statistics Lecture Notes - Monograph Series. pp. 75–80. CiteSeerX 10.1.1.114.632. doi:10.1214/lnms/1196285381. ISBN 978-0-940600-61-4. ISSN 0749-2170. ^ a b c d e f g h Stirzaker, David (2000). "Advice to Hedgehogs, or, Constants Can Vary". The Mathematical Gazette. 84 (500): 197–210. doi:10.2307/3621649. ISSN 0025-5572. JSTOR 3621649. ^ Donald L. Snyder; Michael I. Miller (6 December 2012). Random Point Processes in Time and Space. Springer Science & Business Media. p. 32. ISBN 978-1-4612-3166-0. ^ a b c d Guttorp, Peter; Thorarinsdottir, Thordis L. (2012). "What Happened to Discrete Chaos, the Quenouille Process, and the Sharp Markov Property? Some History of Stochastic Point Processes". International Statistical Review. 80 (2): 253–268. doi:10.1111/j.1751-5823.2012.00181.x. ISSN 0306-7734. ^ Dmytro Gusak; Alexander Kukush; Alexey Kulik; Yuliya Mishura; Andrey Pilipenko (10 July 2010). Theory of Stochastic Processes: With Applications to Financial Mathematics and Risk Theory. Springer Science & Business Media. p. 21. ISBN 978-0-387-87862-1. ^ Valeriy Skorokhod (5 December 2005). Basic Principles and Applications of Probability Theory. Springer Science & Business Media. p. 42. ISBN 978-3-540-26312-8. ^ a b c d e f Olav Kallenberg (8 January 2002). Foundations of Modern Probability. Springer Science & Business Media. pp. 24–25. ISBN 978-0-387-95313-7. ^ a b c d e f g h i j k l m n o p John Lamperti (1977). Stochastic processes: a survey of the mathematical theory. Springer-Verlag. pp. 1–2. ISBN 978-3-540-90275-1. ^ a b c d Loïc Chaumont; Marc Yor (19 July 2012). Exercises in Probability: A Guided Tour from Measure Theory to Random Processes, Via Conditioning. Cambridge University Press. p. 175. ISBN 978-1-107-60655-5. ^ a b c d e f g h Robert J. Adler; Jonathan E. Taylor (29 January 2009). Random Fields and Geometry. Springer Science & Business Media. pp. 7–8. ISBN 978-0-387-48116-6. ^ Gregory F. Lawler; Vlada Limic (24 June 2010). Random Walk: A Modern Introduction. Cambridge University Press. ISBN 978-1-139-48876-1. ^ David Williams (14 February 1991). Probability with Martingales. Cambridge University Press. ISBN 978-0-521-40605-5. ^ L. C. G. Rogers; David Williams (13 April 2000). Diffusions, Markov Processes, and Martingales: Volume 1, Foundations. Cambridge University Press. ISBN 978-1-107-71749-7. ^ David Applebaum (5 July 2004). Lévy Processes and Stochastic Calculus. Cambridge University Press. ISBN 978-0-521-83263-2. ^ Mikhail Lifshits (2012-01-11). Lectures on Gaussian Processes. Springer Science & Business Media. ISBN 978-3-642-24939-6. ^ Robert J. Adler (28 January 2010). The Geometry of Random Fields. SIAM. ISBN 978-0-89871-693-1. ^ Samuel Karlin; Howard E. Taylor (2 December 2012). A First Course in Stochastic Processes. Academic Press. ISBN 978-0-08-057041-9. ^ Bruce Hajek (12 March 2015). Random Processes for Engineers. Cambridge University Press. ISBN 978-1-316-24124-0. ^ a b G. Latouche; V. Ramaswami (1 January 1999). Introduction to Matrix Analytic Methods in Stochastic Modeling. SIAM. ISBN 978-0-89871-425-8. ^ D.J. Daley; David Vere-Jones (12 November 2007). An Introduction to the Theory of Point Processes: Volume II: General Theory and Structure. Springer Science & Business Media. ISBN 978-0-387-21337-8. ^ Patrick Billingsley (4 August 2008). Probability and Measure. Wiley India Pvt. Limited. ISBN 978-81-265-1771-8. ^ Pierre Brémaud (16 September 2014). Fourier Analysis and Stochastic Processes. Springer. ISBN 978-3-319-09590-5. ^ Adam Bobrowski (11 August 2005). Functional Analysis for Probability and Stochastic Processes: An Introduction. Cambridge University Press. ISBN 978-0-521-83166-6. ^ a b Jochen Blath; Peter Imkeller; Sylvie Rœlly (2011). Surveys in Stochastic Processes. European Mathematical Society. ISBN 978-3-03719-072-2. ^ a b c d Samuel Karlin; Howard E. Taylor (2 December 2012). A First Course in Stochastic Processes. Academic Press. p. 27. ISBN 978-0-08-057041-9. ^ a b c d e f g h i j Applebaum, David (2004). "Lévy processes: From probability to finance and quantum groups". Notices of the AMS. 51 (11): 1337. ^ a b L. C. G. Rogers; David Williams (13 April 2000). Diffusions, Markov Processes, and Martingales: Volume 1, Foundations. Cambridge University Press. pp. 121–124. ISBN 978-1-107-71749-7. ^ a b c d e f Ionut Florescu (7 November 2014). Probability and Stochastic Processes. John Wiley & Sons. pp. 294 and 295. ISBN 978-1-118-59320-2. ^ a b Samuel Karlin; Howard E. Taylor (2 December 2012). A First Course in Stochastic Processes. Academic Press. p. 26. ISBN 978-0-08-057041-9. ^ Donald L. Snyder; Michael I. Miller (6 December 2012). Random Point Processes in Time and Space. Springer Science & Business Media. p. 24 and 25. ISBN 978-1-4612-3166-0. ^ a b Patrick Billingsley (4 August 2008). Probability and Measure. Wiley India Pvt. Limited. p. 482. ISBN 978-81-265-1771-8. ^ a b Alexander A. Borovkov (22 June 2013). Probability Theory. Springer Science & Business Media. p. 527. ISBN 978-1-4471-5201-9. ^ a b c Pierre Brémaud (16 September 2014). Fourier Analysis and Stochastic Processes. Springer. p. 120. ISBN 978-3-319-09590-5. ^ a b c d e Jeffrey S Rosenthal (14 November 2006). A First Look at Rigorous Probability Theory. World Scientific Publishing Co Inc. pp. 177–178. ISBN 978-981-310-165-4. ^ a b Peter E. Kloeden; Eckhard Platen (17 April 2013). Numerical Solution of Stochastic Differential Equations. Springer Science & Business Media. p. 63. ISBN 978-3-662-12616-5. ^ a b c Davar Khoshnevisan (10 April 2006). Multiparameter Processes: An Introduction to Random Fields. Springer Science & Business Media. pp. 153–155. ISBN 978-0-387-21631-7. ^ a b c d Doob, Joseph (1934). "Stochastic Processes and Statistics". Proceedings of the National Academy of Sciences of the United States of America. 20 (6): 376–379. Bibcode:1934PNAS...20..376D. doi:10.1073/pnas.20.6.376. PMC 1076423. PMID 16587907. ^ Bert E. Fristedt; Lawrence F. Gray (21 November 2013). A Modern Approach to Probability Theory. Springer Science & Business Media. p. 580. ISBN 978-1-4899-2837-5. ^ a b c d L. C. G. Rogers; David Williams (13 April 2000). Diffusions, Markov Processes, and Martingales: Volume 1, Foundations. Cambridge University Press. pp. 121 and 122. ISBN 978-1-107-71749-7. ^ a b c d e Søren Asmussen (15 May 2003). Applied Probability and Queues. Springer Science & Business Media. p. 408. ISBN 978-0-387-00211-8. ^ a b David Stirzaker (2005). Stochastic Processes and Models. Oxford University Press. p. 45. ISBN 978-0-19-856814-8. ^ John A. Gubner (1 June 2006). Probability and Random Processes for Electrical and Computer Engineers. Cambridge University Press. p. 383. ISBN 978-1-139-45717-0. ^ a b Kiyosi Itō (2006). Essentials of Stochastic Processes. American Mathematical Soc. p. 13. ISBN 978-0-8218-3898-3. ^ M. Loève (15 May 1978). Probability Theory II. Springer Science & Business Media. p. 163. ISBN 978-0-387-90262-3. ^ Pierre Brémaud (16 September 2014). Fourier Analysis and Stochastic Processes. Springer. p. 133. ISBN 978-3-319-09590-5. ^ a b Dmytro Gusak; Alexander Kukush; Alexey Kulik; Yuliya Mishura; Andrey Pilipenko (10 July 2010). Theory of Stochastic Processes: With Applications to Financial Mathematics and Risk Theory. Springer Science & Business Media. p. 1. ISBN 978-0-387-87862-1. ^ Richard F. Bass (6 October 2011). Stochastic Processes. Cambridge University Press. p. 1. ISBN 978-1-139-50147-7. ^ a b , John Lamperti (1977). Stochastic processes: a survey of the mathematical theory. Springer-Verlag. p. 3. ISBN 978-3-540-90275-1. ^ Fima C. Klebaner (2005). Introduction to Stochastic Calculus with Applications. Imperial College Press. p. 55. ISBN 978-1-86094-555-7. ^ a b Ionut Florescu (7 November 2014). Probability and Stochastic Processes. John Wiley & Sons. p. 293. ISBN 978-1-118-59320-2. ^ a b Ionut Florescu (7 November 2014). Probability and Stochastic Processes. John Wiley & Sons. p. 301. ISBN 978-1-118-59320-2. ^ a b Dimitri P. Bertsekas; John N. Tsitsiklis (2002). Introduction to Probability. Athena Scientific. p. 273. ISBN 978-1-886529-40-3. ^ Oliver C. Ibe (29 August 2013). Elements of Random Walk and Diffusion Processes. John Wiley & Sons. p. 11. ISBN 978-1-118-61793-9. ^ Achim Klenke (30 September 2013). Probability Theory: A Comprehensive Course. Springer. p. 347. ISBN 978-1-4471-5362-7. ^ Gregory F. Lawler; Vlada Limic (24 June 2010). Random Walk: A Modern Introduction. Cambridge University Press. p. 1. ISBN 978-1-139-48876-1. ^ Olav Kallenberg (8 January 2002). Foundations of Modern Probability. Springer Science & Business Media. p. 136. ISBN 978-0-387-95313-7. ^ Ionut Florescu (7 November 2014). Probability and Stochastic Processes. John Wiley & Sons. p. 383. ISBN 978-1-118-59320-2. ^ Rick Durrett (30 August 2010). Probability: Theory and Examples. Cambridge University Press. p. 277. ISBN 978-1-139-49113-6. ^ a b c Weiss, George H. (2006). "Random Walks". Encyclopedia of Statistical Sciences. p. 1. doi:10.1002/0471667196.ess2180.pub2. ISBN 978-0471667193. ^ Aris Spanos (2 September 1999). Probability Theory and Statistical Inference: Econometric Modeling with Observational Data. Cambridge University Press. p. 454. ISBN 978-0-521-42408-0. ^ a b Fima C. Klebaner (2005). Introduction to Stochastic Calculus with Applications. Imperial College Press. p. 81. ISBN 978-1-86094-555-7. ^ Allan Gut (17 October 2012). Probability: A Graduate Course. Springer Science & Business Media. p. 88. ISBN 978-1-4614-4708-5. ^ Geoffrey Grimmett; David Stirzaker (31 May 2001). Probability and Random Processes. OUP Oxford. p. 71. ISBN 978-0-19-857222-0. ^ Fima C. Klebaner (2005). Introduction to Stochastic Calculus with Applications. Imperial College Press. p. 56. ISBN 978-1-86094-555-7. ^ Brush, Stephen G. (1968). "A history of random processes". Archive for History of Exact Sciences. 5 (1): 1–2. doi:10.1007/BF00328110. ISSN 0003-9519. ^ a b Applebaum, David (2004). "Lévy processes: From probability to finance and quantum groups". Notices of the AMS. 51 (11): 1338. ^ Iosif Ilyich Gikhman; Anatoly Vladimirovich Skorokhod (1969). Introduction to the Theory of Random Processes. Courier Corporation. p. 21. ISBN 978-0-486-69387-3. ^ Ionut Florescu (7 November 2014). Probability and Stochastic Processes. John Wiley & Sons. p. 471. ISBN 978-1-118-59320-2. ^ a b Samuel Karlin; Howard E. Taylor (2 December 2012). A First Course in Stochastic Processes. Academic Press. pp. 21 and 22. ISBN 978-0-08-057041-9. ^ Ioannis Karatzas; Steven Shreve (1991). Brownian Motion and Stochastic Calculus. Springer. p. VIII. ISBN 978-1-4612-0949-2. ^ Daniel Revuz; Marc Yor (9 March 2013). Continuous Martingales and Brownian Motion. Springer Science & Business Media. p. IX. ISBN 978-3-662-06400-9. ^ Jeffrey S Rosenthal (14 November 2006). A First Look at Rigorous Probability Theory. World Scientific Publishing Co Inc. p. 186. ISBN 978-981-310-165-4. ^ Donald L. Snyder; Michael I. Miller (6 December 2012). Random Point Processes in Time and Space. Springer Science & Business Media. p. 33. ISBN 978-1-4612-3166-0. ^ J. Michael Steele (6 December 2012). Stochastic Calculus and Financial Applications. Springer Science & Business Media. p. 118. ISBN 978-1-4684-9305-4. ^ a b Peter Mörters; Yuval Peres (25 March 2010). Brownian Motion. Cambridge University Press. pp. 1 and 3. ISBN 978-1-139-48657-6. ^ Ioannis Karatzas; Steven Shreve (1991). Brownian Motion and Stochastic Calculus. Springer. p. 78. ISBN 978-1-4612-0949-2. ^ Ioannis Karatzas; Steven Shreve (1991). Brownian Motion and Stochastic Calculus. Springer. p. 61. ISBN 978-1-4612-0949-2. ^ Steven E. Shreve (3 June 2004). Stochastic Calculus for Finance II: Continuous-Time Models. Springer Science & Business Media. p. 93. ISBN 978-0-387-40101-0. ^ Olav Kallenberg (8 January 2002). Foundations of Modern Probability. Springer Science & Business Media. pp. 225 and 260. ISBN 978-0-387-95313-7. ^ Ioannis Karatzas; Steven Shreve (1991). Brownian Motion and Stochastic Calculus. Springer. p. 70. ISBN 978-1-4612-0949-2. ^ Peter Mörters; Yuval Peres (25 March 2010). Brownian Motion. Cambridge University Press. p. 131. ISBN 978-1-139-48657-6. ^ Fima C. Klebaner (2005). Introduction to Stochastic Calculus with Applications. Imperial College Press. ISBN 978-1-86094-555-7. ^ Ioannis Karatzas; Steven Shreve (1991). Brownian Motion and Stochastic Calculus. Springer. ISBN 978-1-4612-0949-2. ^ Applebaum, David (2004). "Lévy processes: From probability to finance and quantum groups". Notices of the AMS. 51 (11): 1341. ^ Samuel Karlin; Howard E. Taylor (2 December 2012). A First Course in Stochastic Processes. Academic Press. p. 340. ISBN 978-0-08-057041-9. ^ Fima C. Klebaner (2005). Introduction to Stochastic Calculus with Applications. Imperial College Press. p. 124. ISBN 978-1-86094-555-7. ^ Ioannis Karatzas; Steven Shreve (1991). Brownian Motion and Stochastic Calculus. Springer. p. 47. ISBN 978-1-4612-0949-2. ^ Ubbo F. Wiersema (6 August 2008). Brownian Motion Calculus. John Wiley & Sons. p. 2. ISBN 978-0-470-02171-2. ^ a b c Henk C. Tijms (6 May 2003). A First Course in Stochastic Models. Wiley. pp. 1 and 2. ISBN 978-0-471-49881-0. ^ D.J. Daley; D. Vere-Jones (10 April 2006). An Introduction to the Theory of Point Processes: Volume I: Elementary Theory and Methods. Springer Science & Business Media. pp. 19–36. ISBN 978-0-387-21564-8. ^ Mark A. Pinsky; Samuel Karlin (2011). An Introduction to Stochastic Modeling. Academic Press. p. 241. ISBN 978-0-12-381416-6. ^ J. F. C. Kingman (17 December 1992). Poisson Processes. Clarendon Press. p. 38. ISBN 978-0-19-159124-2. ^ D.J. Daley; D. Vere-Jones (10 April 2006). An Introduction to the Theory of Point Processes: Volume I: Elementary Theory and Methods. Springer Science & Business Media. p. 19. ISBN 978-0-387-21564-8. ^ J. F. C. Kingman (17 December 1992). Poisson Processes. Clarendon Press. p. 22. ISBN 978-0-19-159124-2. ^ Samuel Karlin; Howard E. Taylor (2 December 2012). A First Course in Stochastic Processes. Academic Press. pp. 118 and 119. ISBN 978-0-08-057041-9. ^ Leonard Kleinrock (1976). Queueing Systems: Theory. Wiley. p. 61. ISBN 978-0-471-49110-1. ^ Murray Rosenblatt (1962). Random Processes. Oxford University Press. p. 94. ^ a b Martin Haenggi (2013). Stochastic Geometry for Wireless Networks. Cambridge University Press. pp. 10 and 18. ISBN 978-1-107-01469-5. ^ a b Sung Nok Chiu; Dietrich Stoyan; Wilfrid S. Kendall; Joseph Mecke (27 June 2013). Stochastic Geometry and Its Applications. John Wiley & Sons. pp. 41 and 108. ISBN 978-1-118-65825-3. ^ J. F. C. Kingman (17 December 1992). Poisson Processes. Clarendon Press. p. 11. ISBN 978-0-19-159124-2. ^ a b Roy L. Streit (15 September 2010). Poisson Point Processes: Imaging, Tracking, and Sensing. Springer Science & Business Media. p. 1. ISBN 978-1-4419-6923-1. ^ J. F. C. Kingman (17 December 1992). Poisson Processes. Clarendon Press. p. v. ISBN 978-0-19-159124-2. ^ Richard Serfozo (24 January 2009). Basics of Applied Stochastic Processes. Springer Science & Business Media. p. 2. ISBN 978-3-540-89332-5. ^ Y.A. Rozanov (6 December 2012). Markov Random Fields. Springer Science & Business Media. p. 58. ISBN 978-1-4613-8190-7. ^ Sheldon M. Ross (1996). Stochastic processes. Wiley. pp. 235 and 358. ISBN 978-0-471-12062-9. ^ Ionut Florescu (7 November 2014). Probability and Stochastic Processes. John Wiley & Sons. pp. 373 and 374. ISBN 978-1-118-59320-2. ^ a b Samuel Karlin; Howard E. Taylor (2 December 2012). A First Course in Stochastic Processes. Academic Press. p. 49. ISBN 978-0-08-057041-9. ^ a b Søren Asmussen (15 May 2003). Applied Probability and Queues. Springer Science & Business Media. p. 7. ISBN 978-0-387-00211-8. ^ Emanuel Parzen (17 June 2015). Stochastic Processes. Courier Dover Publications. p. 188. ISBN 978-0-486-79688-8. ^ Samuel Karlin; Howard E. Taylor (2 December 2012). A First Course in Stochastic Processes. Academic Press. pp. 29 and 30. ISBN 978-0-08-057041-9. ^ John Lamperti (1977). Stochastic processes: a survey of the mathematical theory. Springer-Verlag. pp. 106–121. ISBN 978-3-540-90275-1. ^ Sheldon M. Ross (1996). Stochastic processes. Wiley. pp. 174 and 231. ISBN 978-0-471-12062-9. ^ Sean Meyn; Richard L. Tweedie (2 April 2009). Markov Chains and Stochastic Stability. Cambridge University Press. p. 19. ISBN 978-0-521-73182-9. ^ Samuel Karlin; Howard E. Taylor (2 December 2012). A First Course in Stochastic Processes. Academic Press. p. 47. ISBN 978-0-08-057041-9. ^ Reuven Y. Rubinstein; Dirk P. Kroese (20 September 2011). Simulation and the Monte Carlo Method. John Wiley & Sons. p. 225. ISBN 978-1-118-21052-9. ^ Dani Gamerman; Hedibert F. Lopes (10 May 2006). Markov Chain Monte Carlo: Stochastic Simulation for Bayesian Inference, Second Edition. CRC Press. ISBN 978-1-58488-587-0. ^ Y.A. Rozanov (6 December 2012). Markov Random Fields. Springer Science & Business Media. p. 61. ISBN 978-1-4613-8190-7. ^ Donald L. Snyder; Michael I. Miller (6 December 2012). Random Point Processes in Time and Space. Springer Science & Business Media. p. 27. ISBN 978-1-4612-3166-0. ^ Pierre Bremaud (9 March 2013). Markov Chains: Gibbs Fields, Monte Carlo Simulation, and Queues. Springer Science & Business Media. p. 253. ISBN 978-1-4757-3124-8. ^ a b c Fima C. Klebaner (2005). Introduction to Stochastic Calculus with Applications. Imperial College Press. p. 65. ISBN 978-1-86094-555-7. ^ a b c Ioannis Karatzas; Steven Shreve (1991). Brownian Motion and Stochastic Calculus. Springer. p. 11. ISBN 978-1-4612-0949-2. ^ a b c David Williams (14 February 1991). Probability with Martingales. Cambridge University Press. pp. 93 and 94. ISBN 978-0-521-40605-5. ^ Joseph L. Doob (1990). Stochastic processes. Wiley. pp. 292 and 293. ^ Gilles Pisier (6 June 2016). Martingales in Banach Spaces. Cambridge University Press. ISBN 978-1-316-67946-3. ^ a b J. Michael Steele (6 December 2012). Stochastic Calculus and Financial Applications. Springer Science & Business Media. p. 12 and 13. ISBN 978-1-4684-9305-4. ^ a b P. Hall; C. C. Heyde (10 July 2014). Martingale Limit Theory and Its Application. Elsevier Science. p. 2. ISBN 978-1-4832-6322-9. ^ J. Michael Steele (6 December 2012). Stochastic Calculus and Financial Applications. Springer Science & Business Media. p. 115. ISBN 978-1-4684-9305-4. ^ Sheldon M. Ross (1996). Stochastic processes. Wiley. p. 295. ISBN 978-0-471-12062-9. ^ a b J. Michael Steele (6 December 2012). Stochastic Calculus and Financial Applications. Springer Science & Business Media. p. 11. ISBN 978-1-4684-9305-4. ^ Olav Kallenberg (8 January 2002). Foundations of Modern Probability. Springer Science & Business Media. p. 96. ISBN 978-0-387-95313-7. ^ J. Michael Steele (6 December 2012). Stochastic Calculus and Financial Applications. Springer Science & Business Media. p. 371. ISBN 978-1-4684-9305-4. ^ J. Michael Steele (6 December 2012). Stochastic Calculus and Financial Applications. Springer Science & Business Media. p. 22. ISBN 978-1-4684-9305-4. ^ Geoffrey Grimmett; David Stirzaker (31 May 2001). Probability and Random Processes. OUP Oxford. p. 336. ISBN 978-0-19-857222-0. ^ Glasserman, Paul; Kou, Steven (2006). "A Conversation with Chris Heyde". Statistical Science. 21 (2): 292 and 293. arXiv:math/0609294. doi:10.1214/088342306000000088. ISSN 0883-4237. ^ Francois Baccelli; Pierre Bremaud (11 November 2013). Elements of Queueing Theory: Palm Martingale Calculus and Stochastic Recurrences. Springer Science & Business Media. ISBN 978-3-662-11657-9. ^ P. Hall; C. C. Heyde (10 July 2014). Martingale Limit Theory and Its Application. Elsevier Science. p. x. ISBN 978-1-4832-6322-9. ^ a b c d Jean Bertoin (29 October 1998). Lévy Processes. Cambridge University Press. p. viii. ISBN 978-0-521-64632-1. ^ a b c Applebaum, David (2004). "Lévy processes: From probability to finance and quantum groups". Notices of the AMS. 51 (11): 1336. ^ David Applebaum (5 July 2004). Lévy Processes and Stochastic Calculus. Cambridge University Press. p. 69. ISBN 978-0-521-83263-2. ^ Leonid Koralov; Yakov G. Sinai (10 August 2007). Theory of Probability and Random Processes. Springer Science & Business Media. p. 171. ISBN 978-3-540-68829-7. ^ David Applebaum (5 July 2004). Lévy Processes and Stochastic Calculus. Cambridge University Press. p. 19. ISBN 978-0-521-83263-2. ^ Sung Nok Chiu; Dietrich Stoyan; Wilfrid S. Kendall; Joseph Mecke (27 June 2013). Stochastic Geometry and Its Applications. John Wiley & Sons. p. 109. ISBN 978-1-118-65825-3. ^ Sung Nok Chiu; Dietrich Stoyan; Wilfrid S. Kendall; Joseph Mecke (27 June 2013). Stochastic Geometry and Its Applications. John Wiley & Sons. p. 108. ISBN 978-1-118-65825-3. ^ Martin Haenggi (2013). Stochastic Geometry for Wireless Networks. Cambridge University Press. p. 10. ISBN 978-1-107-01469-5. ^ D.J. Daley; D. Vere-Jones (10 April 2006). An Introduction to the Theory of Point Processes: Volume I: Elementary Theory and Methods. Springer Science & Business Media. p. 194. ISBN 978-0-387-21564-8. ^ a b D.R. Cox; Valerie Isham (17 July 1980). Point Processes. CRC Press. p. 3. ISBN 978-0-412-21910-8. ^ J. F. C. Kingman (17 December 1992). Poisson Processes. Clarendon Press. p. 8. ISBN 978-0-19-159124-2. ^ Jesper Moller; Rasmus Plenge Waagepetersen (25 September 2003). Statistical Inference and Simulation for Spatial Point Processes. CRC Press. p. 7. ISBN 978-0-203-49693-0. ^ Samuel Karlin; Howard E. Taylor (2 December 2012). A First Course in Stochastic Processes. Academic Press. p. 31. ISBN 978-0-08-057041-9. ^ Volker Schmidt (24 October 2014). Stochastic Geometry, Spatial Statistics and Random Fields: Models and Algorithms. Springer. p. 99. ISBN 978-3-319-10064-7. ^ D.J. Daley; D. Vere-Jones (10 April 2006). An Introduction to the Theory of Point Processes: Volume I: Elementary Theory and Methods. Springer Science & Business Media. ISBN 978-0-387-21564-8. ^ D.R. Cox; Valerie Isham (17 July 1980). Point Processes. CRC Press. ISBN 978-0-412-21910-8. ^ a b Alexander A. Borovkov (22 June 2013). Probability Theory. Springer Science & Business Media. p. 528. ISBN 978-1-4471-5201-9. ^ Georg Lindgren; Holger Rootzen; Maria Sandsten (11 October 2013). Stationary Stochastic Processes for Scientists and Engineers. CRC Press. p. 11. ISBN 978-1-4665-8618-5. ^ a b c Valeriy Skorokhod (5 December 2005). Basic Principles and Applications of Probability Theory. Springer Science & Business Media. pp. 93 and 94. ISBN 978-3-540-26312-8. ^ Donald L. Snyder; Michael I. Miller (6 December 2012). Random Point Processes in Time and Space. Springer Science & Business Media. p. 25. ISBN 978-1-4612-3166-0. ^ Valeriy Skorokhod (5 December 2005). Basic Principles and Applications of Probability Theory. Springer Science & Business Media. p. 104. ISBN 978-3-540-26312-8. ^ Ionut Florescu (7 November 2014). Probability and Stochastic Processes. John Wiley & Sons. p. 296. ISBN 978-1-118-59320-2. ^ Patrick Billingsley (4 August 2008). Probability and Measure. Wiley India Pvt. Limited. p. 493. ISBN 978-81-265-1771-8. ^ Bernt Øksendal (2003). Stochastic Differential Equations: An Introduction with Applications. Springer Science & Business Media. p. 10. ISBN 978-3-540-04758-2. ^ a b c d e Peter K. Friz; Nicolas B. Victoir (4 February 2010). Multidimensional Stochastic Processes as Rough Paths: Theory and Applications. Cambridge University Press. p. 571. ISBN 978-1-139-48721-4. ^ Sidney I. Resnick (11 December 2013). Adventures in Stochastic Processes. Springer Science & Business Media. pp. 40–41. ISBN 978-1-4612-0387-2. ^ Ward Whitt (11 April 2006). Stochastic-Process Limits: An Introduction to Stochastic-Process Limits and Their Application to Queues. Springer Science & Business Media. p. 23. ISBN 978-0-387-21748-2. ^ David Applebaum (5 July 2004). Lévy Processes and Stochastic Calculus. Cambridge University Press. p. 4. ISBN 978-0-521-83263-2. ^ Daniel Revuz; Marc Yor (9 March 2013). Continuous Martingales and Brownian Motion. Springer Science & Business Media. p. 10. ISBN 978-3-662-06400-9. ^ L. C. G. Rogers; David Williams (13 April 2000). Diffusions, Markov Processes, and Martingales: Volume 1, Foundations. Cambridge University Press. p. 123. ISBN 978-1-107-71749-7. ^ a b c d John Lamperti (1977). Stochastic processes: a survey of the mathematical theory. Springer-Verlag. pp. 6 and 7. ISBN 978-3-540-90275-1. ^ Iosif I. Gikhman; Anatoly Vladimirovich Skorokhod (1969). Introduction to the Theory of Random Processes. Courier Corporation. p. 4. ISBN 978-0-486-69387-3. ^ a b c d Robert J. Adler (28 January 2010). The Geometry of Random Fields. SIAM. p. 14 and 15. ISBN 978-0-89871-693-1. ^ Sung Nok Chiu; Dietrich Stoyan; Wilfrid S. Kendall; Joseph Mecke (27 June 2013). Stochastic Geometry and Its Applications. John Wiley & Sons. p. 112. ISBN 978-1-118-65825-3. ^ a b Joseph L. Doob (1990). Stochastic processes. Wiley. pp. 94–96. ^ a b Ionut Florescu (7 November 2014). Probability and Stochastic Processes. John Wiley & Sons. pp. 298 and 299. ISBN 978-1-118-59320-2. ^ Iosif Ilyich Gikhman; Anatoly Vladimirovich Skorokhod (1969). Introduction to the Theory of Random Processes. Courier Corporation. p. 8. ISBN 978-0-486-69387-3. ^ Fima C. Klebaner (2005). Introduction to Stochastic Calculus with Applications. Imperial College Press. pp. 22–23. ISBN 978-1-86094-555-7. ^ Peter Mörters; Yuval Peres (25 March 2010). Brownian Motion. Cambridge University Press. p. 37. ISBN 978-1-139-48657-6. ^ a b L. C. G. Rogers; David Williams (13 April 2000). Diffusions, Markov Processes, and Martingales: Volume 1, Foundations. Cambridge University Press. p. 130. ISBN 978-1-107-71749-7. ^ Alexander A. Borovkov (22 June 2013). Probability Theory. Springer Science & Business Media. p. 530. ISBN 978-1-4471-5201-9. ^ Fima C. Klebaner (2005). Introduction to Stochastic Calculus with Applications. Imperial College Press. p. 48. ISBN 978-1-86094-555-7. ^ a b Bernt Øksendal (2003). Stochastic Differential Equations: An Introduction with Applications. Springer Science & Business Media. p. 14. ISBN 978-3-540-04758-2. ^ a b Ionut Florescu (7 November 2014). Probability and Stochastic Processes. John Wiley & Sons. p. 472. ISBN 978-1-118-59320-2. ^ Daniel Revuz; Marc Yor (9 March 2013). Continuous Martingales and Brownian Motion. Springer Science & Business Media. pp. 18–19. ISBN 978-3-662-06400-9. ^ David Applebaum (5 July 2004). Lévy Processes and Stochastic Calculus. Cambridge University Press. p. 20. ISBN 978-0-521-83263-2. ^ Hiroshi Kunita (3 April 1997). Stochastic Flows and Stochastic Differential Equations. Cambridge University Press. p. 31. ISBN 978-0-521-59925-2. ^ Olav Kallenberg (8 January 2002). Foundations of Modern Probability. Springer Science & Business Media. p. 35. ISBN 978-0-387-95313-7. ^ Monique Jeanblanc; Marc Yor; Marc Chesney (13 October 2009). Mathematical Methods for Financial Markets. Springer Science & Business Media. p. 11. ISBN 978-1-85233-376-8. ^ a b c d e f Kiyosi Itō (2006). Essentials of Stochastic Processes. American Mathematical Soc. pp. 32–33. ISBN 978-0-8218-3898-3. ^ Iosif Ilyich Gikhman; Anatoly Vladimirovich Skorokhod (1969). Introduction to the Theory of Random Processes. Courier Corporation. p. 150. ISBN 978-0-486-69387-3. ^ a b Petar Todorovic (6 December 2012). An Introduction to Stochastic Processes and Their Applications. Springer Science & Business Media. pp. 19–20. ISBN 978-1-4613-9742-7. ^ Ilya Molchanov (11 May 2005). Theory of Random Sets. Springer Science & Business Media. p. 340. ISBN 978-1-85233-892-3. ^ a b Patrick Billingsley (4 August 2008). Probability and Measure. Wiley India Pvt. Limited. pp. 526–527. ISBN 978-81-265-1771-8. ^ a b Alexander A. Borovkov (22 June 2013). Probability Theory. Springer Science & Business Media. p. 535. ISBN 978-1-4471-5201-9. ^ Dmytro Gusak; Alexander Kukush; Alexey Kulik; Yuliya Mishura; Andrey Pilipenko (10 July 2010). Theory of Stochastic Processes: With Applications to Financial Mathematics and Risk Theory. Springer Science & Business Media. p. 22. ISBN 978-0-387-87862-1. ^ Joseph L. Doob (1990). Stochastic processes. Wiley. p. 56. ^ Davar Khoshnevisan (10 April 2006). Multiparameter Processes: An Introduction to Random Fields. Springer Science & Business Media. p. 155. ISBN 978-0-387-21631-7. ^ Lapidoth, Amos, A Foundation in Digital Communication, Cambridge University Press, 2009. ^ a b c d Ward Whitt (11 April 2006). Stochastic-Process Limits: An Introduction to Stochastic-Process Limits and Their Application to Queues. Springer Science & Business Media. pp. 78–79. ISBN 978-0-387-21748-2. ^ a b Dmytro Gusak; Alexander Kukush; Alexey Kulik; Yuliya Mishura; Andrey Pilipenko (10 July 2010). Theory of Stochastic Processes: With Applications to Financial Mathematics and Risk Theory. Springer Science & Business Media. p. 24. ISBN 978-0-387-87862-1. ^ a b c d Vladimir I. Bogachev (15 January 2007). Measure Theory (Volume 2). Springer Science & Business Media. p. 53. ISBN 978-3-540-34514-5. ^ a b c Fima C. Klebaner (2005). Introduction to Stochastic Calculus with Applications. Imperial College Press. p. 4. ISBN 978-1-86094-555-7. ^ a b Søren Asmussen (15 May 2003). Applied Probability and Queues. Springer Science & Business Media. p. 420. ISBN 978-0-387-00211-8. ^ a b c Patrick Billingsley (25 June 2013). Convergence of Probability Measures. John Wiley & Sons. p. 121. ISBN 978-1-118-62596-5. ^ Richard F. Bass (6 October 2011). Stochastic Processes. Cambridge University Press. p. 34. ISBN 978-1-139-50147-7. ^ Nicholas H. Bingham; Rüdiger Kiesel (29 June 2013). Risk-Neutral Valuation: Pricing and Hedging of Financial Derivatives. Springer Science & Business Media. p. 154. ISBN 978-1-4471-3856-3. ^ Alexander A. Borovkov (22 June 2013). Probability Theory. Springer Science & Business Media. p. 532. ISBN 978-1-4471-5201-9. ^ Davar Khoshnevisan (10 April 2006). Multiparameter Processes: An Introduction to Random Fields. Springer Science & Business Media. pp. 148–165. ISBN 978-0-387-21631-7. ^ Petar Todorovic (6 December 2012). An Introduction to Stochastic Processes and Their Applications. Springer Science & Business Media. p. 22. ISBN 978-1-4613-9742-7. ^ Ward Whitt (11 April 2006). Stochastic-Process Limits: An Introduction to Stochastic-Process Limits and Their Application to Queues. Springer Science & Business Media. p. 79. ISBN 978-0-387-21748-2. ^ a b c d e f Gagniuc, Paul A. (2017). Markov Chains: From Theory to Implementation and Experimentation. USA, NJ: John Wiley & Sons. pp. 1–2. ISBN 978-1-119-38755-8. ^ David, F. N. (1955). "Studies in the History of Probability and Statistics I. Dicing and Gaming (A Note on the History of Probability)". Biometrika. 42 (1/2): 1–15. doi:10.2307/2333419. ISSN 0006-3444. JSTOR 2333419. ^ L. E. Maistrov (3 July 2014). Probability Theory: A Historical Sketch. Elsevier Science. p. 1. ISBN 978-1-4832-1863-2. ^ a b Seneta, E. (2006). "Probability, History of". Encyclopedia of Statistical Sciences. p. 1. doi:10.1002/0471667196.ess2065.pub2. ISBN 978-0471667193. ^ John Tabak (14 May 2014). Probability and Statistics: The Science of Uncertainty. Infobase Publishing. pp. 24–26. ISBN 978-0-8160-6873-9. ^ Bellhouse, David (2005). "Decoding Cardano's Liber de Ludo Aleae". Historia Mathematica. 32 (2): 180–202. doi:10.1016/j.hm.2004.04.001. ISSN 0315-0860. ^ Anders Hald (25 February 2005). A History of Probability and Statistics and Their Applications before 1750. John Wiley & Sons. p. 221. ISBN 978-0-471-72517-6. ^ L. E. Maistrov (3 July 2014). Probability Theory: A Historical Sketch. Elsevier Science. p. 56. ISBN 978-1-4832-1863-2. ^ John Tabak (14 May 2014). Probability and Statistics: The Science of Uncertainty. Infobase Publishing. p. 37. ISBN 978-0-8160-6873-9. ^ a b Chung, Kai Lai (1998). "Probability and Doob". The American Mathematical Monthly. 105 (1): 28–35. doi:10.2307/2589523. ISSN 0002-9890. JSTOR 2589523. ^ a b c d e f Bingham, N. (2000). "Studies in the history of probability and statistics XLVI. Measure into probability: from Lebesgue to Kolmogorov". Biometrika. 87 (1): 145–156. doi:10.1093/biomet/87.1.145. ISSN 0006-3444. ^ a b Benzi, Margherita; Benzi, Michele; Seneta, Eugene (2007). "Francesco Paolo Cantelli. b. 20 December 1875 d. 21 July 1966". International Statistical Review. 75 (2): 128. doi:10.1111/j.1751-5823.2007.00009.x. ISSN 0306-7734. ^ Doob, Joseph L. (1996). "The Development of Rigor in Mathematical Probability (1900-1950)". The American Mathematical Monthly. 103 (7): 586–595. doi:10.2307/2974673. ISSN 0002-9890. JSTOR 2974673. ^ a b c d e f g h i j Cramer, Harald (1976). "Half a Century with Probability Theory: Some Personal Recollections". The Annals of Probability. 4 (4): 509–546. doi:10.1214/aop/1176996025. ISSN 0091-1798. ^ Truesdell, C. (1975). "Early kinetic theories of gases". Archive for History of Exact Sciences. 15 (1): 22–23. doi:10.1007/BF00327232. ISSN 0003-9519. ^ Brush, Stephen G. (1967). "Foundations of statistical mechanics 1845?1915". Archive for History of Exact Sciences. 4 (3): 150–151. doi:10.1007/BF00412958. ISSN 0003-9519. ^ Truesdell, C. (1975). "Early kinetic theories of gases". Archive for History of Exact Sciences. 15 (1): 31–32. doi:10.1007/BF00327232. ISSN 0003-9519. ^ Brush, S.G. (1958). "The development of the kinetic theory of gases IV. Maxwell". Annals of Science. 14 (4): 243–255. doi:10.1080/00033795800200147. ISSN 0003-3790. ^ Brush, Stephen G. (1968). "A history of random processes". Archive for History of Exact Sciences. 5 (1): 15–16. doi:10.1007/BF00328110. ISSN 0003-9519. ^ a b c d Kendall, D. G.; Batchelor, G. K.; Bingham, N. H.; Hayman, W. K.; Hyland, J. M. E.; Lorentz, G. G.; Moffatt, H. K.; Parry, W.; Razborov, A. A.; Robinson, C. A.; Whittle, P. (1990). "Andrei Nikolaevich Kolmogorov (1903–1987)". Bulletin of the London Mathematical Society. 22 (1): 33. doi:10.1112/blms/22.1.31. ISSN 0024-6093. ^ Vere-Jones, David (2006). "Khinchin, Aleksandr Yakovlevich". Encyclopedia of Statistical Sciences. p. 1. doi:10.1002/0471667196.ess6027.pub2. ISBN 978-0471667193. ^ a b Vere-Jones, David (2006). "Khinchin, Aleksandr Yakovlevich". Encyclopedia of Statistical Sciences. p. 4. doi:10.1002/0471667196.ess6027.pub2. ISBN 978-0471667193. ^ a b Snell, J. Laurie (2005). "Obituary: Joseph Leonard Doob". Journal of Applied Probability. 42 (1): 251. doi:10.1239/jap/1110381384. ISSN 0021-9002. ^ Lindvall, Torgny (1991). "W. Doeblin, 1915-1940". The Annals of Probability. 19 (3): 929–934. doi:10.1214/aop/1176990329. ISSN 0091-1798. ^ a b c Getoor, Ronald (2009). "J. L. Doob: Foundations of stochastic processes and probabilistic potential theory". The Annals of Probability. 37 (5): 1655. arXiv:0909.4213. doi:10.1214/09-AOP465. ISSN 0091-1798. ^ a b Bingham, N. H. (2005). "Doob: a half-century on". Journal of Applied Probability. 42 (1): 257–266. doi:10.1239/jap/1110381385. ISSN 0021-9002. ^ a b c d e Meyer, Paul-André (2009). "Stochastic Processes from 1950 to the Present". Electronic Journal for History of Probability and Statistics. 5 (1): 1–42. ^ "Kiyosi Itô receives Kyoto Prize". Notices of the AMS. 45 (8): 981–982. 1998. ^ Jean Bertoin (29 October 1998). Lévy Processes. Cambridge University Press. p. viii and ix. ISBN 978-0-521-64632-1. ^ J. Michael Steele (6 December 2012). Stochastic Calculus and Financial Applications. Springer Science & Business Media. p. 176. ISBN 978-1-4684-9305-4. ^ P. Hall; C. C. Heyde (10 July 2014). Martingale Limit Theory and Its Application. Elsevier Science. pp. 1 and 2. ISBN 978-1-4832-6322-9. ^ Dynkin, E. B. (1989). "Kolmogorov and the Theory of Markov Processes". The Annals of Probability. 17 (3): 822–832. doi:10.1214/aop/1176991248. ISSN 0091-1798. ^ Ellis, Richard S. (1995). "An overview of the theory of large deviations and applications to statistical mechanics". Scandinavian Actuarial Journal. 1995 (1): 98. doi:10.1080/03461238.1995.10413952. ISSN 0346-1238. ^ Raussen, Martin; Skau, Christian (2008). "Interview with Srinivasa Varadhan". Notices of the AMS. 55 (2): 238–246. ^ Malte Henkel; Dragi Karevski (4 April 2012). Conformal Invariance: an Introduction to Loops, Interfaces and Stochastic Loewner Evolution. Springer Science & Business Media. p. 113. ISBN 978-3-642-27933-1. ^ "2006 Fields Medals Awarded". Notices of the AMS. 53 (9): 1041–1044. 2015. ^ Quastel, Jeremy (2015). "The Work of the 2014 Fields Medalists". Notices of the AMS. 62 (11): 1341–1344. ^ D.J. Daley; D. Vere-Jones (10 April 2006). An Introduction to the Theory of Point Processes: Volume I: Elementary Theory and Methods. Springer Science & Business Media. pp. 1–4. ISBN 978-0-387-21564-8. ^ Anders Hald (25 February 2005). A History of Probability and Statistics and Their Applications before 1750. John Wiley & Sons. p. 226. ISBN 978-0-471-72517-6. ^ a b Joel Louis Lebowitz (1984). Nonequilibrium phenomena II: from stochastics to hydrodynamics. North-Holland Pub. pp. 8–10. ISBN 978-0-444-86806-0. ^ Ionut Florescu (7 November 2014). Probability and Stochastic Processes. John Wiley & Sons. p. 374. ISBN 978-1-118-59320-2. ^ Oliver C. Ibe (29 August 2013). Elements of Random Walk and Diffusion Processes. John Wiley & Sons. p. 5. ISBN 978-1-118-61793-9. ^ Anders Hald (25 February 2005). A History of Probability and Statistics and Their Applications before 1750. John Wiley & Sons. p. 63. ISBN 978-0-471-72517-6. ^ Anders Hald (25 February 2005). A History of Probability and Statistics and Their Applications before 1750. John Wiley & Sons. p. 202. ISBN 978-0-471-72517-6. ^ Ionut Florescu (7 November 2014). Probability and Stochastic Processes. John Wiley & Sons. p. 385. ISBN 978-1-118-59320-2. ^ Barry D. Hughes (1995). Random Walks and Random Environments: Random walks. Clarendon Press. p. 111. ISBN 978-0-19-853788-5. ^ Hald, A. (1981). "T. N. Thiele's Contributions to Statistics". International Statistical Review / Revue Internationale de Statistique. 49 (1): 1–20. doi:10.2307/1403034. ISSN 0306-7734. JSTOR 1403034. ^ a b Lauritzen, Steffen L. (1981). "Time Series Analysis in 1880: A Discussion of Contributions Made by T.N. Thiele". International Statistical Review / Revue Internationale de Statistique. 49 (3): 319–320. doi:10.2307/1402616. ISSN 0306-7734. JSTOR 1402616. ^ a b Courtault, Jean-Michel; Kabanov, Yuri; Bru, Bernard; Crepel, Pierre; Lebon, Isabelle; Le Marchand, Arnaud (2000). "Louis Bachelier on the Centenary of Theorie de la Speculation". Mathematical Finance. 10 (3): 339–353. doi:10.1111/1467-9965.00098. ISSN 0960-1627. ^ Brush, Stephen G. (1968). "A history of random processes". Archive for History of Exact Sciences. 5 (1): 25. doi:10.1007/BF00328110. ISSN 0003-9519. ^ Brush, Stephen G. (1968). "A history of random processes". Archive for History of Exact Sciences. 5 (1): 1–36. doi:10.1007/BF00328110. ISSN 0003-9519. ^ D.J. Daley; D. Vere-Jones (10 April 2006). An Introduction to the Theory of Point Processes: Volume I: Elementary Theory and Methods. Springer Science & Business Media. pp. 8–9. ISBN 978-0-387-21564-8. ^ Embrechts, Paul; Frey, Rüdiger; Furrer, Hansjörg (2001). "Stochastic processes in insurance and finance". Stochastic Processes: Theory and Methods. Handbook of Statistics. 19. p. 367. doi:10.1016/S0169-7161(01)19014-0. ISBN 9780444500144. ISSN 0169-7161. ^ Cramér, Harald (1969). "Historical review of Filip Lundberg's works on risk theory". Scandinavian Actuarial Journal. 1969 (sup3): 6–12. doi:10.1080/03461238.1969.10404602. ISSN 0346-1238. ^ a b Gagniuc, Paul A. (2017). Markov Chains: From Theory to Implementation and Experimentation. USA, NJ: John Wiley & Sons. pp. 2–8. ISBN 978-1-119-38755-8. ^ a b c d Charles Miller Grinstead; James Laurie Snell (1997). Introduction to Probability. American Mathematical Soc. pp. 464–466. ISBN 978-0-8218-0749-1. ^ a b Pierre Bremaud (9 March 2013). Markov Chains: Gibbs Fields, Monte Carlo Simulation, and Queues. Springer Science & Business Media. p. ix. ISBN 978-1-4757-3124-8. ^ a b Hayes, Brian (2013). "First links in the Markov chain". American Scientist. 101 (2): 92–96. doi:10.1511/2013.101.92. ^ Seneta, E. (1998). "I.J. Bienaymé [1796-1878]: Criticality, Inequality, and Internationalization". International Statistical Review / Revue Internationale de Statistique. 66 (3): 291–292. doi:10.2307/1403518. ISSN 0306-7734. JSTOR 1403518. ^ Bru, B.; Hertz, S. (2001). "Maurice Fréchet". Statisticians of the Centuries. pp. 331–334. doi:10.1007/978-1-4613-0179-0_71. ISBN 978-0-387-95283-3. ^ Marc Barbut; Bernard Locker; Laurent Mazliak (23 August 2016). Paul Lévy and Maurice Fréchet: 50 Years of Correspondence in 107 Letters. Springer London. p. 5. ISBN 978-1-4471-7262-8. ^ Valeriy Skorokhod (5 December 2005). Basic Principles and Applications of Probability Theory. Springer Science & Business Media. p. 146. ISBN 978-3-540-26312-8. ^ Bernstein, Jeremy (2005). "Bachelier". American Journal of Physics. 73 (5): 398–396. Bibcode:2005AmJPh..73..395B. doi:10.1119/1.1848117. ISSN 0002-9505. ^ William J. Anderson (6 December 2012). Continuous-Time Markov Chains: An Applications-Oriented Approach. Springer Science & Business Media. p. vii. ISBN 978-1-4612-3038-0. ^ Kendall, D. G.; Batchelor, G. K.; Bingham, N. H.; Hayman, W. K.; Hyland, J. M. E.; Lorentz, G. G.; Moffatt, H. K.; Parry, W.; Razborov, A. A.; Robinson, C. A.; Whittle, P. (1990). "Andrei Nikolaevich Kolmogorov (1903–1987)". Bulletin of the London Mathematical Society. 22 (1): 57. doi:10.1112/blms/22.1.31. ISSN 0024-6093. ^ David Applebaum (5 July 2004). Lévy Processes and Stochastic Calculus. Cambridge University Press. p. 67. ISBN 978-0-521-83263-2. ^ a b c Robert J. Adler (28 January 2010). The Geometry of Random Fields. SIAM. p. 13. ISBN 978-0-89871-693-1. ^ Krishna B. Athreya; Soumendra N. Lahiri (27 July 2006). Measure Theory and Probability Theory. Springer Science & Business Media. ISBN 978-0-387-32903-1. ^ Bernt Øksendal (2003). Stochastic Differential Equations: An Introduction with Applications. Springer Science & Business Media. p. 11. ISBN 978-3-540-04758-2. ^ David Williams (14 February 1991). Probability with Martingales. Cambridge University Press. p. 124. ISBN 978-0-521-40605-5. ^ Rick Durrett (30 August 2010). Probability: Theory and Examples. Cambridge University Press. p. 410. ISBN 978-1-139-49113-6. ^ Patrick Billingsley (4 August 2008). Probability and Measure. Wiley India Pvt. Limited. pp. 493–494. ISBN 978-81-265-1771-8. ^ Alexander A. Borovkov (22 June 2013). Probability Theory. Springer Science & Business Media. pp. 529–530. ISBN 978-1-4471-5201-9. ^ Krishna B. Athreya; Soumendra N. Lahiri (27 July 2006). Measure Theory and Probability Theory. Springer Science & Business Media. p. 221. ISBN 978-0-387-32903-1. ^ a b Robert J. Adler; Jonathan E. Taylor (29 January 2009). Random Fields and Geometry. Springer Science & Business Media. p. 14. ISBN 978-0-387-48116-6. ^ Krishna B. Athreya; Soumendra N. Lahiri (27 July 2006). Measure Theory and Probability Theory. Springer Science & Business Media. p. 211. ISBN 978-0-387-32903-1. ^ Alexander A. Borovkov (22 June 2013). Probability Theory. Springer Science & Business Media. p. 536. ISBN 978-1-4471-5201-9. ^ Benjamin Yakir (1 August 2013). Extremes in Random Fields: A Theory and Its Applications. John Wiley & Sons. p. 5. ISBN 978-1-118-72062-2. Jarrow, Robert; Protter, Philip (2004). "A short history of stochastic integration and mathematical finance: the early years, 1880–1970". A Festschrift for Herman Rubin. Institute of Mathematical Statistics Lecture Notes - Monograph Series. pp. 75–91. doi:10.1214/lnms/1196285381. ISBN 978-0-940600-61-4. ISSN 0749-2170. Robert J. Adler (2010-01-28). The Geometry of Random Fields. SIAM. ISBN 978-0-89871-693-1. Robert J. Adler; Jonathan E. Taylor (2009-01-29). Random Fields and Geometry. Springer Science & Business Media. ISBN 978-0-387-48116-6. Pierre Brémaud (2013-03-09). Markov Chains: Gibbs Fields, Monte Carlo Simulation, and Queues. Springer Science & Business Media. ISBN 978-1-4757-3124-8. Joseph L. Doob (1990). Stochastic processes. Wiley. Anders Hald (2005-02-25). A History of Probability and Statistics and Their Applications before 1750. John Wiley & Sons. ISBN 978-0-471-72517-6. Crispin Gardiner (2010-10-19). Stochastic Methods. Springer. ISBN 978-3-540-70712-7. Iosif I. Gikhman; Anatoly Vladimirovich Skorokhod (1996). Introduction to the Theory of Random Processes. Courier Corporation. ISBN 978-0-486-69387-3. Emanuel Parzen (2015-06-17). Stochastic Processes. Courier Dover Publications. ISBN 978-0-486-79688-8. Murray Rosenblatt (1962). Random Processes. Oxford University Press.